When Korea’s foremost civilian ambassador, Choi Jung-wha, walked along Paris’ Champs-Elysees Avenue last year, she was struck by familiar tunes sung in Korean. Young French people belted out K-pop band BTS’ songs in Korean, to the surprise of Choi, who first landed in France in the late 1970s for her studies. Back then, Korea, much less South Korea, was barely on the mental map of an average French person. But with the country’s continuing economic and cultural ascent on the global stage, the Korean language itself, along with its modern and traditional culture, has now become all the rage for youngsters the world over. In an age of globalism and hyper-connectivity, public diplomacy is a realm not confined to diplomats, public figures and high-flying personas, but of all citizens committed to espousing and communicating with the world at large, Choi told The Korea Herald last week. 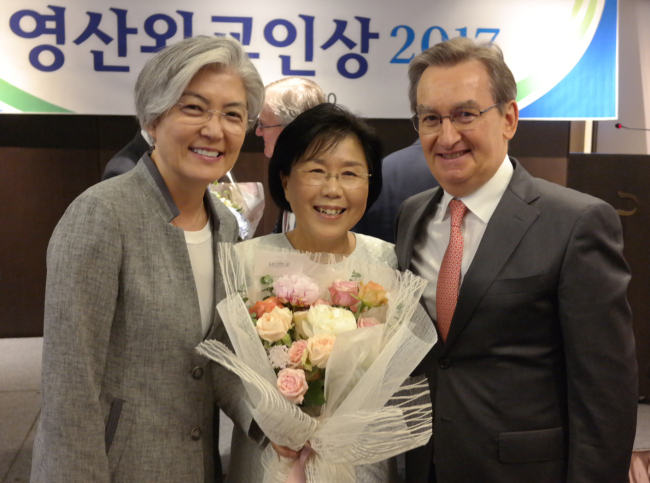 For her decadeslong efforts to promote Korea worldwide and introduce foreign cultures here, Choi was honored with the Yeongsan Diplomat Award in July last year, along with former South Korean Ambassador to the US Ahn Ho-young. The award was conferred by the Seoul Forum for International Affairs, and at the award ceremony, South Korean Foreign Minister Kang Kyung-wha gave congratulatory remarks in front of British, French, Japanese and Singaporean ambassadors, politicians, businesspeople and journalists. In 2003, Choi received the highest award in France, the Legion d’Honneur. Due to Korea’s cutthroat material pursuits, many people have instilled an instinct of “me-first,” she argued, adding that through CICI’s activities she has met countless exemplary citizen ambassadors of their native cultures. Pointing out that Koreans have largely thought of themselves as a homogenous nation, the scholar-communicator said the “myth of national homogeneity” is not an asset in today’s globalized world, since progress occurs through the coalescence of different ideas, as well as creativity formed through collaboration and competition. Mentioning CICI’s CQ Forum -- a networking platform for opinion leaders with a focus on the five “C” quotients of culture, communication, cooperation, concentration and creativity -- Choi said many foreign ambassadors who are members have expressed deep appreciation for the multifaceted opportunities to learn about Korea. On the future of the country’s cultural promotion worldwide, Choi stressed the need for expanding beyond pop culture to traditional cultural aspects, such as hanok architecture, furniture design, Buddhist temples, meditation, food and drinks. As an example, her pupils, instead of working as French interpreters and translators, are teaching the Korean language and culture in Francophone countries, and venturing as far as Africa.